Before the start of the Toray Pan Pacific Open Tennis tournament, Yaroslava Shedova, Vladimira Uhlirova and Agnieszka Radwanska spend some time attending a sumo wrestling match. Here are some pictures of them posing with the wrestlers. At the entrance of the sumo stadium. 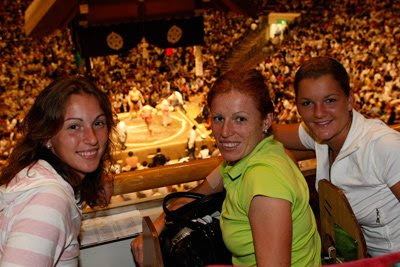 Posed in the stands during a visit to a sumo match.